Oogst, A Merkle Company, is the leading digital marketing, analytics and optimization agency in the Netherlands. Based in Amsterdam, its team of over 70 experts provide leading brands with digital marketing services aimed at utilizing customer data in the best possible way to achieve the highest returns. The company has partnered with VWO since 2012 to test and optimize some of the most popular websites of the country for their clients. Their extensive knowledge of, and experience with the VWO platform has led to these operations continually growing in size. Moreover, this has also led to increased stakeholder involvement and more intensive test management. 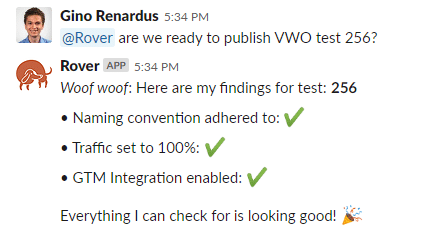 In order to better deal with this increased scope, the Oogst team was recently joined by a new member: a CRO Chatbot that operates through the VWO Application Programming Interface (API). This chatbot is able to assist in many of the activities surrounding the CRO process. Since 1926, HEMA has made the everyday life of its customers easier and more fun through products that positively stand out: due to their quality, design and price. HEMA offers over 30,000 of its own products and services, has over 750 stores in nine countries and 19,000 employees. As consumers move more towards online, HEMA recognizes the importance of developing a digital strategy as progressive as the brand is. HEMA’s webshop is widely recognized to be one of the best of The Netherlands, with a top position in the Twinkle 100 and by frequently receiving awards such as Best Department Store Webshop. 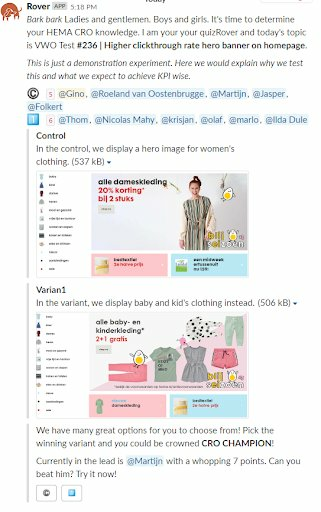 HEMA and Oogst collaborate on CRO to ensure its Dutch and international webshops remain among the best.